Human growth hormone (HGH) is naturally produced in the human body in the anterior lobe of the pituitary gland. Growth hormone (GH) secretion occurs in a pulsatile fashion following a circadian (daily) rhythm, which is controlled by a central area of the brain known as the hypothalamus. The hypothalamus regulates serum GH levels through the release of two functionally opposing hormones: growth hormone-releasing hormone stimulates GH release, while somatotropin release-inhibiting hormone reduces it. With its anti-aging effect, HGH plays an important role in cell regeneration, tissue repair, maintaining bone and muscle strength, fat breakdown, maintaining tight skin and healthy hair and nails. Proteins and collagen tissue all throughout the body require growth hormones’ rejuvenating effect for a person to stay youthful. Few minutes after being secreted into the bloodstream, the liver turns HGH into insulin-like growth factor-one (IGF-1), responsible for most of the growth functions in the body. Secretion of HGH is highest during childhood, helping the body to grow. A gradual decrease in HGH secretion, called somatopause, happens with age or with metabolic damage. HGH begins to decline at an average rate of 14% per decade from 20 years of age. This decline increases to 30% by the age of 40 and further to 80% by 60 years of age. As we age, the amount of cells we lose is more than we make is one of the effects of declining levels of HGH. Exercising for at least 10 minutes pumps up the growth hormone production in the body, increasing HGH secretion in the body. Intense exercise above the lactate threshold elicits the maximum stimulus to the secretion of HGH. Secretion of HGH due to endurance workouts and training at high intensity in short intervals, allows us burning of fat for fuel while the body is in rest or asleep. HIIT workouts like sprints, circuit training, and burpees are effective in stimulating HGH and general well-being of the body. HIIT can help you to boost the amount of HGH the body produces by 300-500%. Exercising in a state of fast has a profound effect on HGH. During HIIT, the body uses the anaerobic energy system, which is the use of energy from the stored glucose in the body. It switches to anaerobic energy system; burning of fat at rest when the body runs out of anaerobic energy. Getting enough sleep and cutting out exposure to computers, televisions, tablets, and phones an hour before bed are key to proper HGH secretion. In fact, in elderly people, this is the only time growth hormone gets secreted. The majority of HGH pulsatile secretion happens in the slow wave sleep cycle between 11 pm and 2 am. It drops slightly after that and rises again at dawn. Lack of sleep interferes with the pituitary and hypothalamus function of HGH secretion in the body. Sleep deprived individuals, like people working during the night shift or those who stay up late at night studying or partying, are negatively impacted throughout the day. Sleep deprivation can reduce growth hormone release the morning after and can severely disturb and alter the sleep-wake cycle. A spike in insulin level, through consumption of sugar, carbohydrates, and alcohol, also inhibits growth hormone spike during sleep. Intermittent fasting, which involves eating only in a certain window of time, is one of the best ways to stimulate HGH. Skipping a meal and intermittent fasting puts the body in the state of nutritional deprivation, secreting HGH to meet the energy requirements of the body. 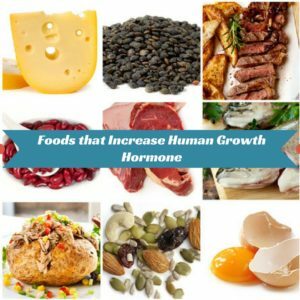 Constant feeding suppresses the body’s natural increase in growth hormone, as there is plenty of energy available from food needed for growth. Intermittent fasting makes you more sensitive to insulin, improves your protein synthesis efficiency, primes your body to release more growth hormone, and has many other anti-aging benefits. Liver cleansing and detoxification enhances the full benefits of HGH to the body through a better production of IGF-1. As IGF-1 is responsible for most of the growth functions in the body, increased muscle mass and increased energy, you should go on a liver cleanse as a way to naturally boost HGH. Regular intake of certain vitamins like vitamin A, B5, B12, chromium and zinc promote HGH production in the body. Consuming food items rich in vitamin C helps increase HGH secretion and there is a direct correlation between reduced HGH, obesity, increased waist-hip ratio and increased risk of cardiovascular diseases. People who suffer from HGH deficiency can benefit from taking vitamin D supplements. Vitamin D has a direct impact on IGF-1 which is important for HGH functioning. Glutamine: Provides important benefits in maintaining lean body tissue and in preserving muscle mass. Consumption of even a small amount of glutamine (2000 mg) has been shown to increase the levels of GH in the body. Arginine: On its own arginine produces a significant increase in HGH when taken before bed and increases the release of GH at rest. It produces even greater levels of GH in combination with exercise. Orthinine and Arginine: Combination of these two has a synergizing effect on the body as they augment the impact of resistance training by aiding an increase in lean body mass and strength. Even dosage as small as 1 gm is effective in enhancing strength and lean tissue mass. L-Arginine: This is another synergistic combination that shows a significant increase in HGH when taken at rest, but not when taken before exercise. Some sources of L-arginine are food items like eggs, meat, fish, nuts, coconut and seeds like pumpkin, sesame and sunflower seeds. L-Lysine and L-glutamine: Found in animal proteins as well as pulses and nuts, these amino acids also increase growth hormone. Keeping yourself hydrated with 6-8 glasses of water per day and having a diet comprising majorly of vegetables is optimal for increasing HGH secretion. By eating healthy you also will not be filling yourself up with junk food and hampering the functioning of your liver. Also, by minimizing your carb intake and keeping a low sugar intake, you can prevent liver diseases, thereby increasing the benefits of HGH. A decline in HGH with age is inevitable along with its aging symptoms. However, it is possible to prevent or postpone this decrease in HGH naturally and diminish the aging effects. Artificial treatments like HGH injections and performance-enhancing steroids to build muscle mass can have harmful side effects. Moreover, creating a dependency on artificial treatment it hampers the body’s ability to produce GH naturally. Therefore, go for these tips to boost Human Growth Hormone naturally.